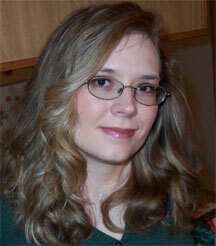 The Muffin is happy to talk with Beth Cato today, runner-up in the Summer 2008 Flash Fiction contest. If you haven't read Beth's winning story, "Junk and Mothballs," yet, you can click here. Make sure to check it out! Beth resides in Buckeye, Arizona, on the outskirts of Phoenix. Her husband Jason, autistic son Nicholas, and two crazy cats keep her very busy, but she still manages to squeeze in time for writing and other activities that help preserve her sanity. Beth is originally from Hanford, California, but she lived all over the country during Jason's time in the Navy; she is quite content to have her husband out of the service and home most evenings, though her time as a military spouse has provided tremendous writing material. Her essay "Home is Where the Kitties Are" is featured in the book The Ultimate Cat Lover. Beth's fiction has been published in The Shine Journal, and she received an honorable mention in the Ligonier Valley Writers Zombie Flash Fiction Contest. She's seeking representation for her women's sci-fi novel, The Locked Door, and is working on a new near-future superhero fantasy titled Normal. National Novel Writing Month is celebrated in her household each November, though the degree of celebration varies wildly dependent on her word count and caffeine level. Her current projects and blog are all accessible through her website: http://www.bethcato.com/. WOW: Hi Beth! Thanks for taking time out to chat with us today. In your winning story, "JUNK AND MOTHBALLS," the reader is wondering what exactly the main character is searching for and really doesn't discover it until the twist at the end. Did you have that ending planned when you started the story? Do you often write endings with a sort-of twist? Beth: No, that ending wasn't planned. I was searching right along with my character. My first inclination was to have her find some rare collectible worthy of the "Antiques Roadshow." I soon realized that wasn't the right approach at all. I thought back on a story from my own family – after my great-grandmother died, her sons decided to go through her belongings and throw out everything that they deemed "junk." This unfortunately included many things that were important to my grandma, such as papers and photographs. One person's junk is indeed another one's treasure. I have written several short stories with this sort of twist, though most of them fall flat and won't ever be submitted any place. WOW: We're glad that you decided to submit this one! And I've heard many writers say you have to practice writing--that's what all the stories and novels are in our drawers--our practice. You have also written a sci-fi novel for which you are searching for representation. Are there any similarities in your writing process for a flash fiction piece and your novel, such as characterization, plot, setting, outlining, and so on? Beth: The writing process is very different because of the time and effort involved. With flash fiction, I have the grain of an idea, and I let it develop in my head for a few days. I might write the concept on paper in my journal. When I feel ready, I type the story. With flash, if I think on the idea too long it becomes impossible to confine the story to the necessary 500 or 1,000-word limit. In that way, writing flash fiction is a lot harder than writing a novel. You have to introduce the character or characters, propel the plot, create a climax and resolve everything – tidily – in mere paragraphs. With my novels, I spend months on research, character backgrounds, and chapter summaries before I even begin the real writing. The end result still needs to be tidy, of course, but it's a lot easier to build character and suspense over 80,000-words than in 500-words. WOW: Thanks for sharing your writing process with us for novels and flash fiction. It is interesting to see into the writing process of other writers! This piece is realistic fiction, but your novel length works seem to tend toward fantasy/sci-fi. Which do you enjoy more? Which do you find easier to write? Beth: I definitely have a preference for stories with a touch of the extraordinary. I read and enjoy everything from fantasy to literary fiction to straightforward history books, and the subjects of my writing are just as diverse. As to which is easier? That depends.Sometimes a story flows out and seems to work with little effort on my part. The genre doesn't have much bearing on that. WOW: It sounds like you have a lot of variety in your writing, which is probably encouraging to many writers out there. Sometimes, you will hear the advice that you have to stick to one genre, but it does seem possible to write and be successful at what captures your attention at the moment (as you have). In your bio, I read that you spent many years as a military wife,and you are also the mother of one son and 2 crazy cats. I also noticed that you've had a cat essay published. How much of your real life makes it into your writing? Why do you enjoy writing about your life? Beth: I use tiny scraps of my life experience throughout my writing – both fiction and nonfiction – which is rather funny since I've led a very un-extraordinary life. Despite my lack of worldliness, there are still little life lessons and family stories I can utilize. My cats are an endless source of material. As my aunt once said, "Are our cats born crazy, or do we make them that way?" Crazy makes for great writing. My experience as a military wife has inspired several essays and as well as the basis for my novel The Locked Door, which involves a disillusioned Navy wife discovering the impact of her existence on multiple dimensions. I enjoy writing about subject matter that I know well, but I always take care that my characters don't become "Mary Sues" based too much on myself. The fun part is taking the familiar and twisting it into something new. WOW: I like the question your aunt posed about cats--I think that same question could be asked about all pets, especially dogs. Several writers have a touch of themselves in their work--it's almost impossible not to. You also maintain a blog and a website. Tell us a little about what kind of material we will find on both. Beth: My blog is updated several times a week and focuses on my journey as a writer. Sometimes I discuss the importance of goals or the thrill of an acceptance, and other times, I speak more about the distractions from my writing - such as my son. The kid has a radar that detects the second I open Word to start writing or editing. My website announces my publications and provides links if the material is online. WOW: That's a great idea to provide links to your writing if the material is online. That is something many of us could incorporate into our websites. What is your writing routine like? Beth: My writing routine is all about squeezing in writing at every opportunity! My best writing days are those when my son has preschool, giving me a long, uninterrupted stretch where I can write, edit, or research. However, ideas don't always wait for a convenient moment. I've thrown together many a rough draft during the forty-five minute respite provided by our Elmo's Potty Time DVD. When I'm working on a long project like NaNoWriMo or editing my novel drafts, I set word count and chapter goals on a daily basis, and I fight to get it done through fire and brimstone – though in my house, that usually means a candle sets off the smoke alarm or sopping up potty-training seepage throughout the house. For a lot of years, I put off writing because there were just too many other distractions and demands on my time. I came to realize that there was no ideal time; if I wanted to write, I had to be flexible. I'd say my routine is more about steady progress towards my daily and weekly goals than on writing during a specific time slot every day. As long as it gets done and I keep slogging through, that's what matters. WOW: Thank you for sharing that with us. I think many writing moms and day job writers can relate to what you said and maybe use that technique, too. It is a good idea to set a daily goal and then fit writing in where you can. It has been great chatting with you today, Beth. We wish you the best of luck! Could you please check the link to Beth's story? Every time I try, get an error message that the document can't be found. Thanks. Would love to read "Junk and Mothballs." Thanks for fixing the link, Margo. The story is exquisitely crafted, Beth! Thank you, Susanne! I'm glad you enjoyed it.